See new items and find out other information related to my Etsy shop, Bohemian Earth, where I sell handcrafted one-of-a-kind and limited edition jewelry featuring pieces made with turquoise, jasper, agate, and other semi-precious stones, brass, copper, sterling silver and Nepalese pendants. This necklace was a spontaneous creation. I originally planned to design a bracelet, but a necklace soon evolved out of the materials I wanted to use together. I've been experimenting with white backgrounds and lighting, and I think the combination of the two elements was perfect for this one-of-a-kind piece. Because I enjoyed making this piece so much, I plan to make a few more that incorporate a bohemian palette. This necklace is both minimal and bohemian. And, despite it's neutral palette, it is full of texture and pattern. The necklace will make a statement with its various natural materials and eye-catching focal piece. 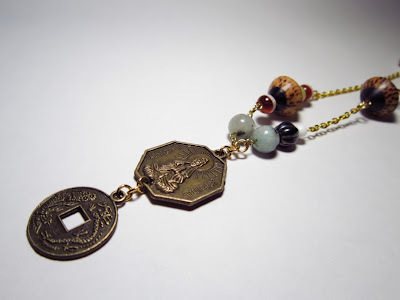 The necklace is reversible as the antique bronze Guanyin (Kwan Yin) centerpiece and replica Chinese dynasty coin are double-sided. Guanyin is the Bodhisattva of compassion and is believed to observe or hear the cries of the world; on the back of this quarter-sized centerpiece is the yin yang symbol. The dynasty coin, which is penny-sized, bring luck with a dragon on one side and Chinese characters on the other. Two striking saucer-shaped palmwood and water buffalo horn inlay beads, handpainted and polished by Filipino craftspeople are on each side of the necklace. These horn used in these beads is a by-product, which makes these beautiful beads a sustainable result. One of these beads is grouped with an olivine jade stone and two carnelian colored agate stones with white bands (olivine is perfect for drawing luck and money). Near the focal piece are two sesame jasper (also known as kiwi jasper) stones. One stands alone and another is paired with white shell and a fluted, iris brown iridescent Preciosa Czech pressed glass bead. Near the spring clasp of the necklace is a grouping of olivine and agate that will draw interest to the back of the wearer's neck. This necklace looks amazing both coming and going! This necklace is lightweight and measures 23 ¼" from end-to-end. The pendant is 2" long and is about an inch wide at its widest point. The chain is gold-plated iron that is nickel and lead free. The chain has a beautiful soft, yet luminous, luster. You can buy "Bohemian Engagement I" here on Etsy! I earned my PhD in English in May 2016. I make jewelry, write poetry, practice yoga, and love good food and wine. Welcome to my Bohemian Earth Etsy shop companion blog. In this blog, you will find photos of and information about jewelry I've made. See current items for sale at BohemianEarth.Etsy.com. See my curated Etsy Treasury Lists here. New necklace and bracelet preview! Visit my Etsy shop today!